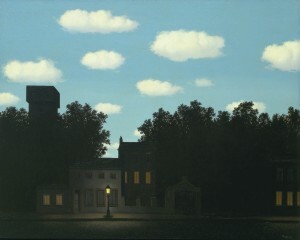 Magritte demonstrates that, contrary to our assumption, maybe day and night can co-exist. It’s sometimes hard to believe spring is here with these cold temperatures and the continuing threat of snow, but we are oh, so ready to put winter behind us. Spring is a time of renewal, and as new life springs up from the earth, we start to feel new possibilities. Belgian surrealist painter Rene Magritte (1898-1967) challenged people to let go of assumptions and consider not what is, but what could be. His paintings, some of which are currently on display in a special exhibition at the New York Metropolitan Museum of Art, depict ordinary objects and normal people arranged in ways that seem impossible. But are they? 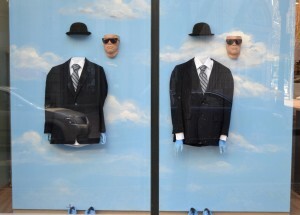 Maybe Magritte is really telling us to rethink what is possible. Dress shoes of Magritte’s period give our mannequins the ability to take a stroll in style. Who needs legs anyway? Inspired by the MOMA exhibition, we’ve created a new window display that we think Magritte would approve of. 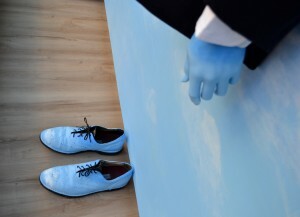 It features a sky backdrop found in many of Magritte’s paintings and men in the Magritte style – complete with suit, period dress shoes and bowler hat. 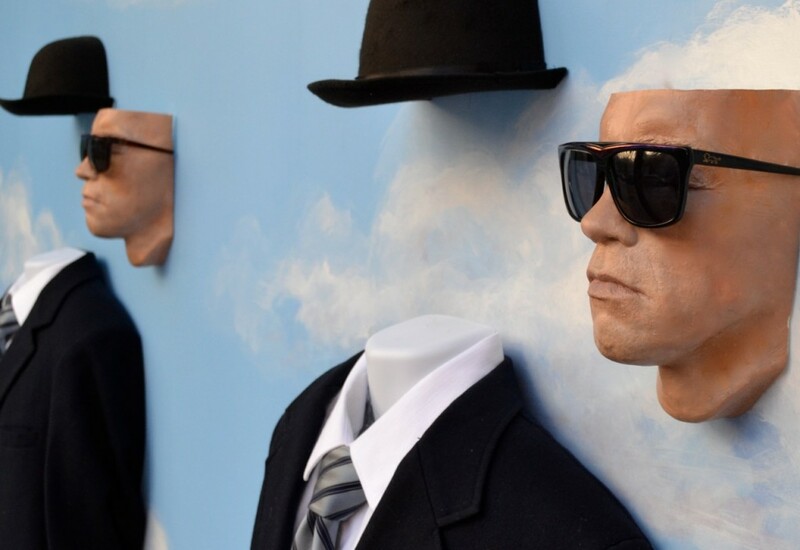 We chose Arnold Schwarzenegger’s visage as the face of the men. In a twist reminiscent of Magritte’s style, we pulled apart the pieces of the men and put them near each other, but not quite together. What does it symbolize? Well, that’s in the eye of the beholder. Surrealism is all about what the image means to you.